The Monumento às Bandeiras (literally 'monument to the flags'), found on the insidesaopaulo logo, is fifty meters long and sixteen meters high, was unveiled in 1954 as part of the opening of Ibirapuera Park as part of São Paulo's 4th centennial celebration. The massive sculpture pays tribute to the bandeirantes ('those who follow the flags'), the explores who helped create São Paulo's culture. The monument reflects the diversity for which Brazil is so well known, depicting Portuguese settlers alongside black and indigenous men (and some women) working together to pull the a canoe, a familiar scene in their ubiquitous river expeditions. The monument is a granite sculpture designed by Victor Brecheret located opposite the Palácio Nove de Julho Legislative Assembly and close to Ibirapuera Park. Dear Editors, the 'bandeirantes' statue depicts colonial slave traders on horseback and black/indigenous slaves in CHAINS. Your text is nothing but an indecent apology of slavery in Brazilian history. Shameful that the statue is even retained in São Paulo & shame on you for this description. Best! 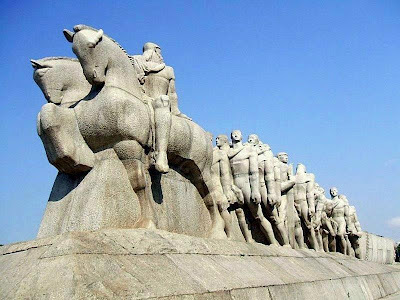 Why is there a need to talk so nicely about these brutal enslavers and hide the inequal power relations like: `the monument reflects the diversity for which Brazil is so well known, depicting Portuguese settlers alongside black and indigenous men (and some women) working together to pull the a canoe`? You have written this in 2011. Is there really people left who agree with your description? Very puzzling.